Talk about the royal treatment… Lately we’re obsessing over Flora Ex Machina‘s Royal Ghee, a modern take on Ayurvedic prash — a divine blend of ghee and honey. 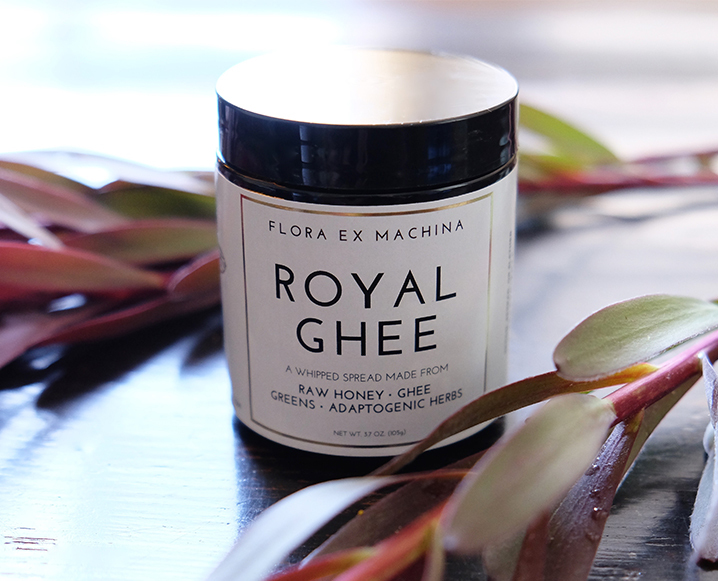 Royal Ghee turns the healing power of raw honey, clarified butter, adaptogens and greens into a buttery blend that is both both deeply nourishing and cake batter-level delicious. Is there anything better? Royal Ghee is sourced from the finest organic ingredients including grass-fed, pastured and traditionally made ghee, raw California wildflower honey and a blend of medicinal, energizing and alkalizing greens, adaptogenic herbs, grounding roots and immunity-boosting mushrooms. Royal Ghee provides a daily boost of nutrition and energy with the flavor of a creamy, decadent treat. Royal Ghee can be consumed daily as a nutritive boost by the spoonful, added to smoothies, “bulletproof” tea and coffee, spread onto toast and slathered as icing… the possibilities are endless. Like chyawanprash, Royal Ghee is blended with potent medicinal ingredients that are known to: provide energy, boost immunity, promote digestion, help to eliminate toxins, boost nutrient absorption, and promote cell rejuvenation with antioxidant content and fatty acids. Tocotrienols: derived from organically grown brown rice: a super concentrated source of bioavailable vitamins E and D, with a high antioxidant count. Greens and Algae: moringa, cracked cell-wall chlorella, nettles, barley grass, wheat grass, spirulina, spinach, alfalfa, dandelion leaf, kelp, dulse. Roots, Berries and Fruit: whole schizandra concentrate, beet root, lemon and orange peel. Warm chaga tea in a saucepan on the stovetop to a simmer. Then, add all ingredients to a blender and blend until smooth and creamy. Snag another stunning and balanced recipe from Flora Ex Machina here! Share the post "Royal Ghee: The New Daily Tonic We’re Loving For Winter"
wow! where can east coast get some?